Limelight was Charlie Chaplin's last film for United Artists, his last American feature film, and his last film of any significance. However, it was not widely seen in its day, due in part to the director's well-publicized clashes with a Red-sniffing U.S. government over his leftist political leanings. Chaplin probably didn't know at the time that Limelight would be his closing artistic statement, but the film certainly has the thick sentimental sheen of a career swan song, one rife with unmistakably autobiographical shadings. Unquestionably, the film exhibits Chaplin at his most mawkish and self-pitying. Here is the Chaplin of The Great Dictator's closing speech, minus the authentic passion: prone to grandiose monologues at the slightest provocation, usually on the topic of the meaning of life or the fickle tastes of the mob. Add to this the unsubtle moralizing of the Hayes Code era, and the result is one of the director's most distressingly self-indulgent and ungainly works. The weepy story of washed-up "Comic Tramp" Calvero (Chaplin) and the pure-hearted ballerina he cares for and eventually loves (a radiant Claire Bloom) is cardboard-thin stuff, prone to treading water when it's not bellowing its themes to the heavens. Of course, narrative richness has never been an attribute of Chaplin's works, which at their best function as slightly sorrowful, ultimately uplifting comic fables, garbed in timeworn vaudevillian gags and inspired tomfoolery. If anything, Limelight is too bombastic and too assured of its own melancholic character to weave the delicate magic that emanates effortlessly from an outwardly frivolous film such as City Lights, or even The Gold Rush. This isn't to say that Limelight doesn't have its stray pleasures. The film regards Calvero with a frustrating but nonetheless fascinating ambiguity, and it's unclear if the character is ultimately deserving of approbation, sympathy, dismissal, or contempt. The ballet sequences, performed by Bloom's double Melissa Hayden, are stylish and handsome, if somewhat conspicuously positioned as a dose of high art within an oeuvre that is otherwise so proudly pop in its bones. 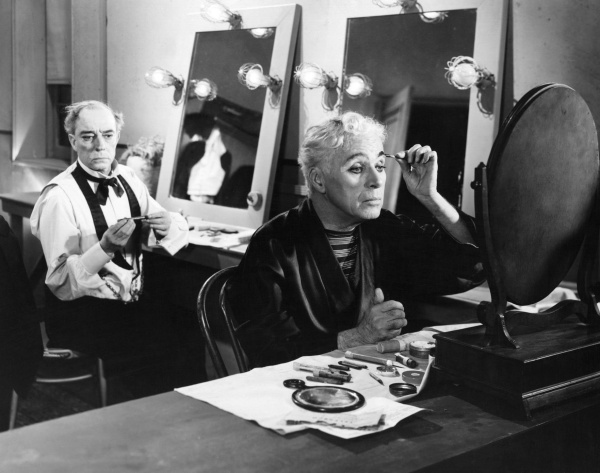 And, of course, the film features a gratifying musical comic sequence with Chaplin and his celebrity rival from the silent era, Buster Keaton, in their only appearance together on screen. Indeed, Keaton's extended and agonizing stage business with a sheaf of orchestral music is probably the best visual gag in the whole film.